The office of Republican Sen. David Perdue sent a heartfelt message to a World War II veteran Monday after his family announced that all he wanted for his 95th birthday were greetings from the community. John Knowles, a Georgia-based WWII veteran and Purple Heart recipient twice over, asked for cards to celebrate his 95th birthday Tuesday. The responses flooded in from all over Georgia as well as from more than 15 other states. 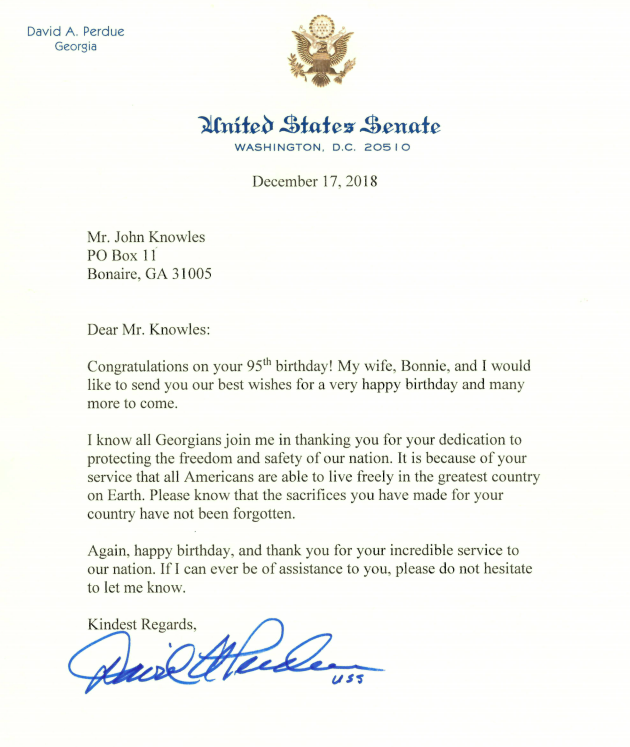 Knowles even received a birthday card from the grandson of a member of his unit, now living in Arkansas, reported WGXA. Perdue also obliged Knowles’ birthday request and sent him a birthday card through the mail. Knowles’ wife of 69 years, Nadine, has read him every card that the veteran has received since his eyesight has been declining. However, he hopes to be able to read them himself in the future. “One of these days when it really gets warm, maybe I can go outside and read some of them,” Knowles said.